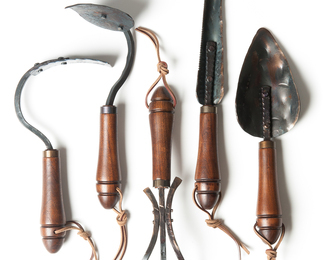 Tuli Fisher – founder of Fisher Blacksmithing – not only elevates garden tools to works of art, he pays homage to the ancient craft of hand forging tools. A gardener himself, Tuli describes his pieces as “heirloom quality” – sturdy enough to withstand generations spent digging in the dirt. To create these beautiful hand trowels, hoes and rakes, Tuli fires his forge to 1,800 degrees Fahrenheit, putting hammer to anvil to shape each high-carbon-steel blade. Before the metal cools, he stamps various patterns into the surface—personal touches that make his tools one of a kind – then affixes the metal to hardwood handles he turns himself. Tuli also gets creative with recycled materials, using old parts from sickle mowers, salvaged sheet metal and rebar, and scrap leather from a sandal-maker to form and embellish each piece. 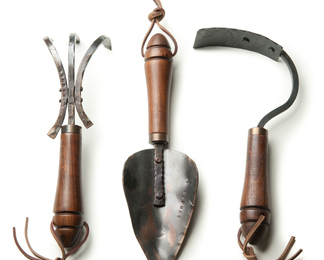 These tools are destined for the hands of garden enthusiasts who worship a simple, tangible and time-honored process of their own. In addition to making fabulous garden tools, Tuli is a horseshoer with more than 12 years of experience. Tuli has demonstrated traditional blacksmithing techniques at Conner Prairie Settlement in Indiana and the Museum of the Rockies in Bozeman, Montana. He’s a member of the British Artist Blacksmith Association as well as the Artist Blacksmith Association of North America. Fisher Blacksmithing is based in Bozeman, Montana.